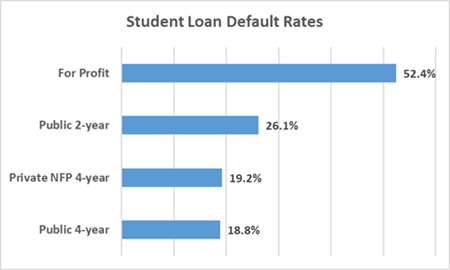 Let’s start with the obvious sore thumb: the for-profit schools … with a default rate north of 50%. Critically speaking, the for-profit schools charge relatively high prices per course (think: “by the drink”). And, they sell hard and admit practically anyone who can slap some dough on the ticket counter. That sounds pretty bad until you consider that these for-profit schools often offer practical skills programs (think: HVAC technicians) … and are offering opportunities to students who aren’t likely candidates for degree programs at more traditional public or NFP private schools. If these schools are forced to underwrite student loans, they – as profit maximizers – will certainly cut back …. admitting fewer marginal students who are unlikely to attain a certificate or degree. That makes sense … except some babies get thrown out with the bath water: the 25% who do earn certificates or degrees. There’s a social cost to that, right? The public schools are uninteresting from a ‘should they underwrite’ perspective since the burden ultimately falls to taxpayers any way. But, what about the private NFP colleges? Shouldn’t they have to fund student loans out of their fat endowments? All private NFP colleges aren’t equal. Sure, Harvard, Yale and Princeton could fund loans out of their endowments, but those schools aren’t the problem. Their default rates are relatively low. Because — thanks to mommy & daddy — a relatively low proportion of their students graduate with an outstanding loan … and — thanks to generous scholarship programs — those that do, have relatively low loan balances. For example, less than 20% of Princeton students graduate with an outstanding loan … and the average loan is less than $10,000. With a Princeton degree in hand, that paltry loan balance is a slam dunk … so, defaults are minimal. OK, that’s the likes of H, Y and P. The “haves”. But, what about the “have nots” … the hundreds of smallish private colleges that are schooling the vast majority of students? They don’t have strong balance sheets and fat endowments. Many of them are hanging by a thread financially .. fighting hard to attract a critical mass of qualified students. The bottom line is that they don’t have the financial strength to underwrite their student’s loans. Many (most?) would probably be forced to close their doors. That may sound like a simple ‘survival of the fittest’ situation until you consider that these schools are, in fact, educating the vast majority of students. Bottom line: Forcing schools to underwrite student loans may initially sound like a panacea … but, the situation is way more complicated than it seems at first blush. This entry was posted on April 4, 2019 at 6:59 am and is filed under Student Loans. You can follow any responses to this entry through the RSS 2.0 feed. You can leave a response, or trackback from your own site.